At this year's VISION exhibition, Vision Components will present the VC nano cube dual, an intelligent stereo camera based on the proven VC nano cube line. Featuring two sensor heads that measure merely 22 x 22 x 22.5 mm, the new camera is especially suited for 3D tasks and alignment applications, such as the positioning of printing plates by means of register marks, where small dimensions and a low weight are essential. The sensor heads are connected to the VC nano housing through a connector with a small diameter. The standard cable length is 3 m, greater lengths are possible on request. The camera's trigger input enables precise, synchronous image capture. The VC nano cube dual is equipped with a memory capacity of 32 MB Flash and 128 MB DDR-RAM. Thanks to a computing power of 5,600 MIPS, it is very fast and powerful. 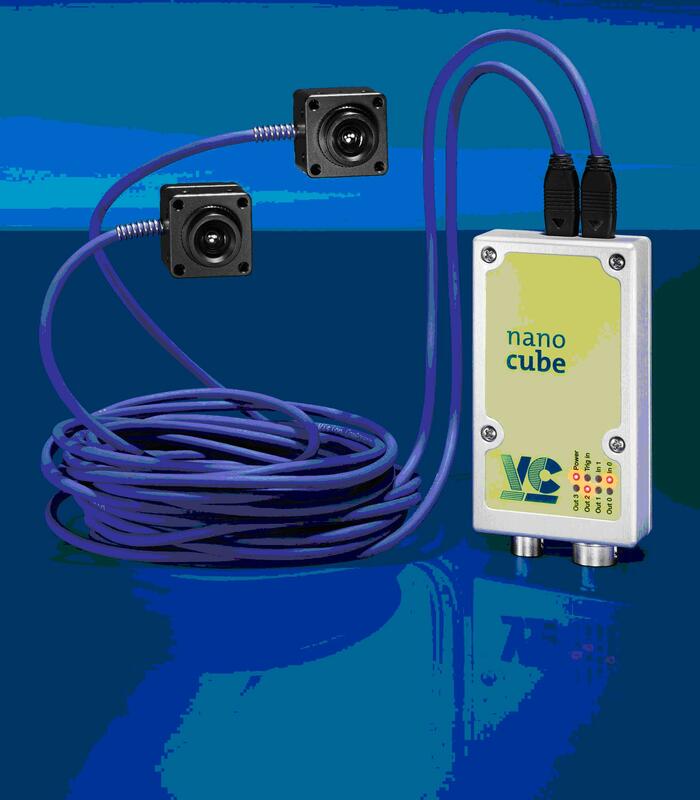 Like all intelligent cameras from Vision Components, the VC nano cube dual independently executes all image processing routines without an external PC. The cameras are equipped with an Ethernet interface and an optional RS232 interface. A global shutter CMOS sensor that can compete with the performance of a CCD sensor and provides crystal-clear pictures even in extremely fast applications records images with a 752 x 480 pixel resolution at a frame rate of 60 fps. Founded in 1996 by Michael Engel, inventor of the first intelligent camera for industrial applications, Vision Components GmbH is a leading supplier in the field of machine vision. Branches and distributors represent the Ettlingen-based company worldwide in more than 25 countries. Vision Components develops and distributes intelligent, network-compatible real-time Smart Cameras which are able to operate without a PC. These embedded vision solutions can be easily integrated into almost any machine or plant. The product portfolio includes Smart Cameras with or without a protective housing, single board cameras, and vision sensors. Vision Components also develops custom-tailored machine vision solutions for a wide range of applications. Amongst others, typical applications include quality inspection and automation. Equipped with the proprietary multitasking VCRT operating system, VC Smart Cameras can be easily configured for all possible tasks. Furthermore, VC provides software libraries for many applications including motion capture, decoding, measurement, and positioning.